Don Weiss presented a charming, sometimes humorous, show of his own photographs of mammals, starting with a photo of his cat at home,then venturing into his yard with photos of deer and chipmunks, then into the neighborhood with red fox at a local park, then further afield with sightings from around the state of PA and finally going national at parks, including Yellowstone. We learned that a wildlife photographer has to have great patience and be willing to put up with all types of weather. 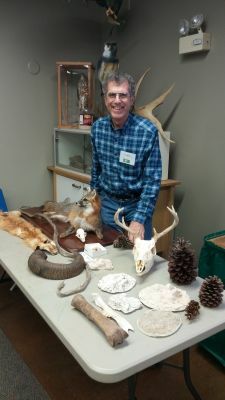 He also brought an exhibit of various mammal-related items.